As we all know, being a Mom is not the easiest task. Seriously, when my first son came along I was so unprepared for motherhood. The second time around has been much easier on me, but it still is a ton of work. It's only easier because I've got more experience. My friend April Perry started The Power of Moms a couple of years ago with her friend Saren Loosli and they just recently launched a new version! Their free site for Moms is a powerful resource for every and any kind of mother. I feel bad that it's taken me this long to share her site with the rest of you! The Power of Moms has essays to empower you, monthly challenges and values, motherhood secrets (tips on coping from those with experience) and fabulous ideas for strengthening your family and lists of brilliant books. You'd think that was enough, but there is more to this site. 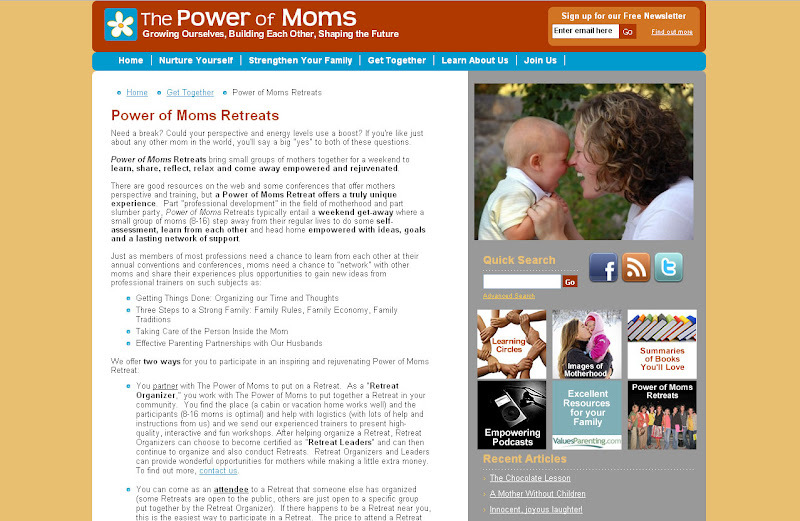 I think my favorite part is their Power of Mom's Retreat for small groups of Moms. (Note: the retreats are not free.) You have the option of participating in a retreat or organizing one! I have wanted to participate in one of these retreats for a long time. April, any chance you'd come to Seattle? Please go join this wonderful community of Moms, learn, share, participate, and enjoy. Also, please share this resource with other Moms out there. We could all be a little bit better. Thanks so much for doing this post, Maggie! I would love to come to Seattle someday.... I miss you. You have a great blog here, and I love all your crafts. I definitely need some inspiration in that area, so I'll be checking back. Have a great day! Thanks for the recommendation. Sounds like a great blog. One of my friends attended a recent Mom Retreat. I didn't know they were connected. We should bring one to Seattle Maggie!